I recently potty trained my 2 year 4 months daughter. She is now able to hold, remove her cloths, do her business and dress herself up. Like most toddlers who are ready for potty training, she’s at a point in her life where she hates disposable diapers. She feels restrained in them. It got to a point where I’ve just put the diaper on to go to bed, and ten minutes later she’s crying and begging to have it removed claiming that she needs to use the potty. No matter how hard I tried, I could not get her to pee in the diaper. Removing it was not a better option as the glue never holds that well after it has been tampered with. As a mother, the comfort of my child comes first. I therefore started investigating ways in which we can all be happy; I keep her dry at night and she gets to be comfortable. The search was made more necessary by the fact that most days, she would wake up with a dry diaper which is pure wastage; the least you can do when you have a diaper on is to at least wet it, right? That’s how I thought about washable diapers. I had read about them when I was reviewing the wet/dry diaper bag and found them interesting. Washable reusable baby diapers are breathable material pants with washable and absorbent inserts for holding the pee. They come in bright and fun colors and I asked my daughter to choose the colors she would like. She easily chose yellow and then red. The pants themselves have numerous snaps to make them adjustable. They can therefore fit babies of different sizes from infants to toddlers. The inserts on the other hand are white, extremely absorbent and incredibly soft. The one main reason I liked them better than the Pampers and Bouncy diapers that I am used to is the fact that she did not wake up with the faint nasty smell associated with the disposable diapers. Unlike the disposable diapers, you have to wash them like the name suggests in order to reuse. The fact that they are absorbent means that they do not dry as fast as you would like especially if you air dry your laundry like I do. To ensure that you are covered even on cold days, buy at least 3 of them. You can also buy two and a number of inserts. 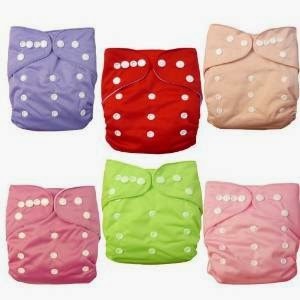 Where do I get the Washable Reusable diapers in Nairobi? If you would like to transition to washable diapers and are wondering where to get them in Nairobi, try the baby shops around Biashara Street, major supermarkets in town or simply order from Jumia Kenya. Check the washable reusable diapers on Jumia now. Or send an email to modernmomkenya@gmail.com to place an order for a discounted price of Ksh. 700 each. Don’t forget to take advantage of the Jumia Kenya Black Friday Flash Sales this November. Hello ModernmomHQ, I also sell these diapers which comes with a six month warranty. I sew them so I ensure quality of production goes into them. You can find me on Facebook Okore Gertrude, join my group #nappy-inginstyle to place their orders. I have a wealth of info about cloth diapers which I share, I don't think you want to miss that out. It includes: laundering, sewing if you are a diy mummy, how to get a pattern for sewing your diapers, inserts, where to buy inserts, what kinds are the best, upcycling clothes to make inserts, will you save money when cloth diapering among other info. Why you should cloth diaper if you are not already. I'll Make sure I visit your site Gertrude. For those of you emailing me asking where you can get disposable diapers, talk to Gertrude as well. Do sell medium size adult washable diapers? Where can I get there in Mombasa. What is the cost of this diapers?